A friend gave us over 100 pine cones and said "See, what can you make with these?" 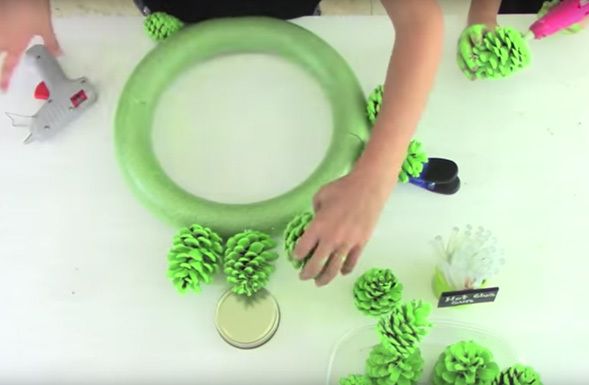 Of course, we love a challenge, and immediately scoured the internet for different pine cone crafts. Lo and behold we stumbled on the most clever Monster Halloween Wreath by Linda at Craftaholics Anonymous®. 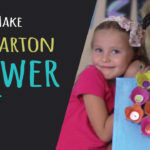 Her original tutorial can be seen here. 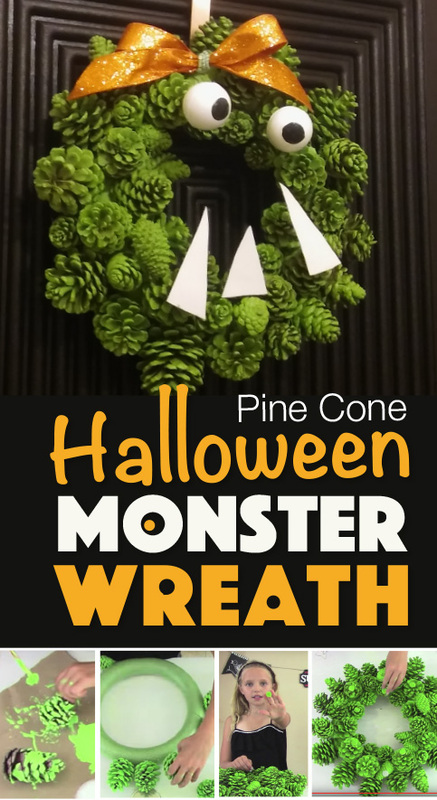 The Monster Halloween Wreath was not only a perfect use for our pine cones, but ideal for the season. Truth be told this craft is a bit time consuming; however the results are stunning. We put so much effort into painting our pine cones that we wanted to extend the life of our Halloween Wreath and transform it into a Christmas Wreath. 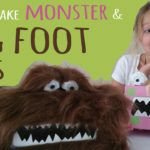 Very easy to do by attaching the Monster facial features with velcro and swapping them out for "The Grinch" features. 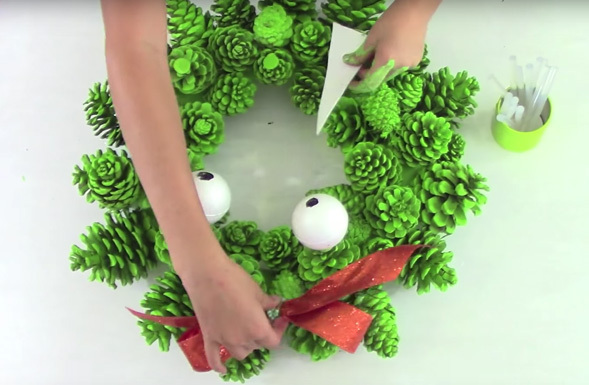 We'll do an official tutorial on our "Christmas Grinch Wreath" next. 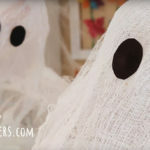 If you can't wait...get a sneak peek of what it looks like in our YouTube Video. • Pine Cones in various sizes - We used 46. 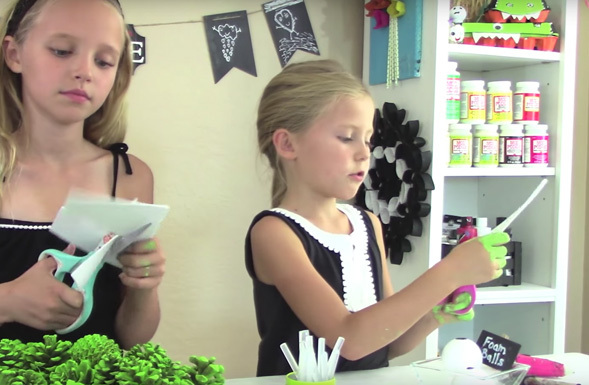 • Hot Glue Gun with tons of Glue Sticks. STEP 1: If you found your pine cones outside it's a good idea to bake them in the oven at 200 degrees for 20 minutes. This will get rid of any bugs that may be hiding inside your pine cones. If you bought your pine cones, move to the next step. 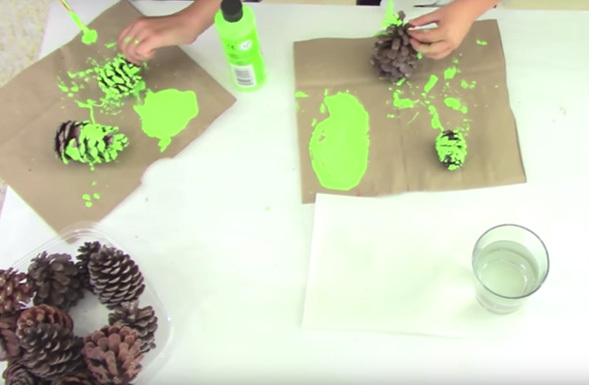 STEP 2: Paint your pine cones and let them dry overnight. We used a paint brush with hard bristles to get into the nooks & crannies of the pine cones. This step takes a while, so grab the neighborhood kids and have fun ;-). Just being honest. NOTE: We tried dipping the entire pine cone in paint, but ran into two snags: 1) Dipping used a lot of paint & 2) Due to the moisture of the paint, as the dipped pine cones were drying they closed up. We didn't have this problem when we painted them individually. Yep...spray painting the pine cones would probably be quicker; however because we're kids, we chose the hand-painted method. NOTE: Using Craftaholics Anonymous® tip, we glued our large pine cones around the edge, filling the wreath in with a variety of sizes as we moved along. STEP 4: Realizing this was a lot of work, we started wondering if we could extend the life of our Halloween Wreath by converting it into a Christmas Wreath. 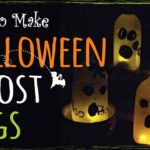 So we decided to attach our Halloween Monster features with small velcro tabs. This gave us the flexibility to swap our the Halloween eyes, bow & teeth for our Christmas Grinch eyes, santa cap & smile. 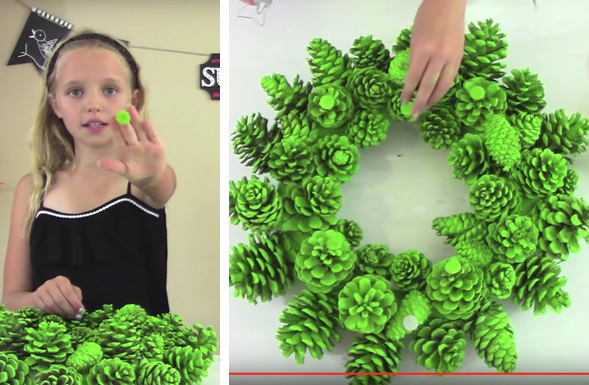 NOTE: We purposely painted our white velcro tabs with the same green paint we used on the pine cones. Then we hot glued them in position on the Halloween Wreath. If you pre-position your monster, eyes, bow & teeth on the wreath you can easily determine where to put the velcro tabs. 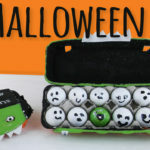 STEP 5: Paint black circles into the middle of the White foam ball for Monster eyes. STEP 6: Cut triangles out of White foam for the teeth. STEP 7: Tie the Orange ribbon into a bow & puff out the loops. STEP 9: Hang on your door using a wreath hanger and enjoy! We'll do a separate tutorial for "The Christmas Grinch Wreath"; however if you want a sneak peek watch our How to Make a Monster Halloween Wreath on YouTube.